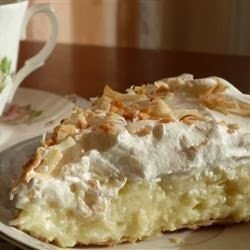 This is a tried-and-true, old-fashioned coconut cream pie. Took many years of searching and baking to find the right one and this is it! Enjoy! In a medium saucepan, combine the half-and-half, eggs, sugar, flour and salt and mix well. Bring to a boil over low heat, stirring constantly. Remove the pan from the heat, and stir in 3/4 cup of the toasted coconut and the vanilla extract. Reserve the remaining coconut to top the pie.